Manufactured from high quality steel. Durable pressed steel platform. Outfitted with a push/pull handle on both sides to secure your load. Sturdy steel construction. Fitted with non-marking rubber protective buffer strip to protect walls and door frames when hand truck is in use. 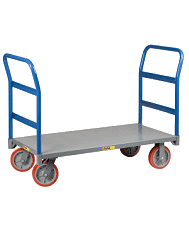 Non-slip PVC platform surface ensures maximum grip to eliminate movement of load when in transit. Two (2) swivel and two (2) rigid low noise casters for sensitive environments and high quality double ball bearings. Double painted finish.